If you have a child who recently entered middle school, you may have noticed that he or she has been struggling to adjust to the heavier workload and more difficult tests. And while you may have seen a few Cs pop up on the last report card, now is the time to get ready for a more successful second half of the school year. Here are a few tips for helping your student develop better study habits. It's easy for kids to become overwhelmed by all the quizzes, homework, book reports and exams their first year of middle school involves, so you may want to pay closer attention to class assignments. Check in with your student every night about projects and upcoming tests so you can both create a manageable schedule for getting it all done. Environment can have a big impact on how effectively your child gets his or her assignments done. If you haven't done so already, creating a quiet workspace – such as sectioning off a corner of the kitchen or buying a desk for the bedroom – can allow your student to work free from distractions like family conversations, pesky siblings or a blaring TV. Sometimes your student may not understand a particular reading assignment or math problem, so make sure you're available to provide help. 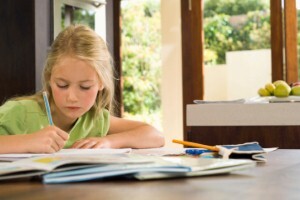 Simply working through the homework with your child (without just giving away the answers!) and being there to answer questions can boost his or her understanding and GPA.